The DEWALT DCD996P2 Hammer drill driver is ideal for most drilling and hammering applications. 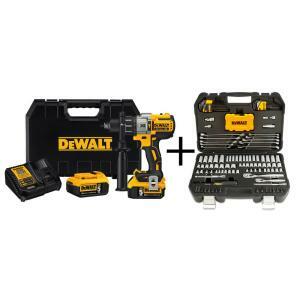 This hammer drill features an innovative brushless design. The 20-Volt MAX Lithium Ion battery packs are designed for long runtime and shelf life. For a limited time get a bonus 142-piece mechanics tool set with purchase. Tbook.com crawls the web to find the best prices and availability on Hammer Drills and related Tools and Hardware products like Dewalt 20-Volt MAX XR Lithium-Ion Cordless Premium 1/2 inch Brushless Hammer Drill Kit with Bonus 142-Piece.... For this page, related items include products we find that match the following keywords: "Hammer Drill" at our vendor partner Home Depot. Dewalt 20-Volt MAX XR Lithium-Ion Cordless Premium 1/2 inch Brushless Hammer Drill Kit with Bonus 142-Piece... is one of 148 Hammer Drills and related products listed in the Tools and Hardware section of Tbook.com If you have any questions on this product, please give us a call at 734-971-1210 during the hours of 9am - 5pm EST for assistance. Thank you for shopping at Tbook.com, the Internet Department Store!